Tracking interest rates and researching loan programs can be overwhelming, but with Alerus Mortgage you receive simple online tools and access to an experienced mortgage specialist who helps with the home buying process from start to finish. Thinking about refinancing? There are a number of things to consider before refinancing your mortgage. 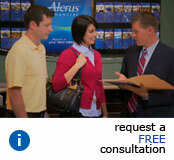 Our specialists are here to help you choose the best option. Copyright © 2019 Alerus Mortgage, a division of Alerus Financial N.A.